Waveland Bowl is the largest bowling alley in Chicago with 40 lanes, all with automatic scoring. Programmable bumpers are available on every lane for children. We have two bars, a billiards area, a children’s movie theater and a restaurant. We have won numerous awards within the city and the bowling industry, such as being voted “Chicago’s Best Bowling Center” two years in a row by CitySearch! We also accept reservations for any type of event you’d like to have. Whether it’s a birthday party, corporate event, fundraiser, or just getting some friends together (minimum 10 for a reservation), we can help! Reservations may be made Monday – Thursday between 9:00 AM and 4:00 PM. For more information, contact us here or call (773) 472-5900. Be sure to visit our Apparel Shop and see what we have to offer. 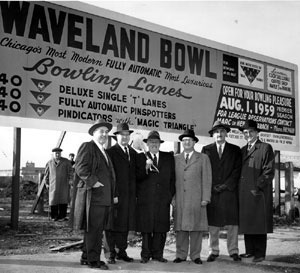 No, this is not a scene from “Goodfellas.” This fine group of gentlemen put Waveland Bowl on the map. 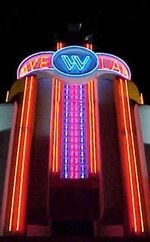 Since 1959, Waveland Bowl has been locally owned and operated. The neon sign that towered above our entrance for over 40 years was a Chicago Landmark, but sadly, its’ functional life ended. The image on the right is the new tower, which has become a landmark in its’ own right! Bowling is only the beginning at Waveland Bowl!